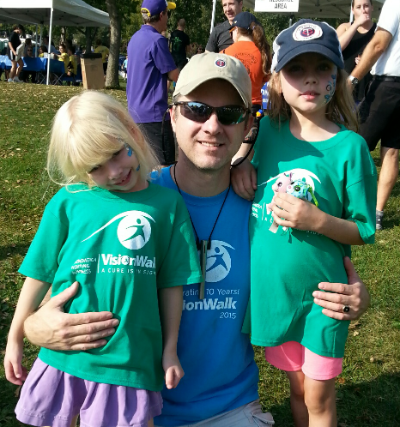 Shawn and his daughters, Siena and Sadie, at VisionWalk Twin Cities 2017. My name is Shawn, and I have Usher syndrome type 3. My parents discovered my hearing loss at age 4 after realizing that I wasn’t ignoring them when called from behind. So that is when I was introduced to hearing aids in both ears. The hearing aids were exactly what I needed, but at first, it was a difficult transition because I had just begun Kindergarten. One day, the Kindergarten teacher yelled at me during class in front of all my classmates because she thought I wasn’t paying attention, whereas, I just didn’t hear her call on my name to answer a question. At the end of class, I went out in the hallway and sat down on the stairs crying amidst all the chatter and chaos of everyone getting to their next class. As the crowd dispersed, a (different) teacher noticed and sat down to console me. At age 7, I was playing T-ball in left field, and a ball was hit in my direction. I was unable to find the ball on the ground near me, and by the time I found the ball, it was already an inside-the-park homerun. That was when my parents, whom were in attendance at the game, realized something was wrong with my vision. I didn’t know what normal vision was supposed to be like. So, off to the University of Minnesota for some testing and then home with the diagnosis of Usher Syndrome. I faced many challenges and anxiety while growing up in a small town and attending a mainstream school. I was more comfortable just “getting by” (pretending) rather than being honest with what I was seeing and hearing. I just wanted to be a normal kid doing normal things. Academically, I scored above average despite not hearing everything being said in the classroom on a daily basis. Most of the time, I sat near the front of the class so I could hear the teacher better and see the chalkboard writing. I have a high dependency on lip-reading and often times the teacher would be talking while facing the chalkboard while writing. It was very difficult to follow classroom and group discussions, and therefore I was unable to participate as much as I would have liked to. I laughed when everybody else laughed just for the sake of blending in while I had no clue what was being said. I didn’t speak up, but rather, I “got by” because I didn’t want to draw attention to myself in that way. I depended mostly on a few close friends and my own study time to make up for what I missed. That classroom incident in Kindergarten may have been more traumatic than I had realized. I am very athletic and love sports, but team sports was always too difficult because there are too many moving parts to watch out for. Because I was tall for my age, basketball probably could have been my best sport. But with tunnel vision, I would have been injury-prone and most likely lead the league in turnovers and fouls. Another significant issue was that through my eyes, the basketball blended in with the floor and surroundings. However, I did try to play baseball but my baseball career was more of just wanting to get the big hit. When I was in the field (most of the time I played in right field to be away from most of the ball action), I just wanted to get it over with so that I could bat. I often prayed the ball would NOT be hit to me, but when it did, I would watch the infielders move towards me in the outfield as my own way of locating the ball. And I would act like I stumbled when I couldn’t find the ball to avoid embarrassment. I don’t even know if the coach knew I couldn’t see the ball well because I really wasn’t upfront about it. One time in junior high summer league, the coach surprisingly pulled me off first base to do some pitching right in the middle of a real game. I didn’t know what he was thinking since I had never pitched before, and I only knew how to throw a fastball. In addition to that, I wouldn’t be able to see the signals from the catcher if he was even giving me signals. That experiment resulted in a complete disaster as I walked several batters and plunked several more in one inning, thus giving up a handful of runs without any hits. It got to the point where the batters didn’t even bother to swing, which became irritating and embarrassing for me. So I stuck with bowling and golf. For someone with RP, bowling is a really good sport to take up as you can only go in one direction and the bowling ball is large enough to see well enough. I love bowling and still bowl in leagues to this day. Even though I cannot see the lane arrows any longer, I can still maintain a 170-175 season average most of the time. I roll a hook shot, and using the arrows is an important element for that kind of a shot. When I golf, someone has to spot my golf ball, and help with direction as well as distance. Oh, and be responsible to yell FORE! whenever necessary. Taking the blame for me in that scenario is totally optional, but certainly appreciated! I do golf fairly well considering my low vision, but it is very difficult to correct my swing when I cannot see what the ball is doing in-flight. When playing individual sports, I was very competitive because when I won or did well on any given day, it made me feel like I conquered Usher Syndrome. But on the other hand, if I had a bad game, I would take it really hard because it compounded my struggles. But as my Usher Syndrome worsened over the years, I had to change my perspective of sports and try to accept the reality of my abilities. These days, I really enjoy good sportsmanship and appreciate the fact that I can still play, and play fairly well. In the summer of 1984 prior to my 11th grade high school year, my family and I flew to Washington, D.C. to a family orientation program at the Modified Secondary School for the Deaf (MSSD) on the Gallaudet college campus. We met a man named Art, who was deaf and blind. He gave a very inspirational speech with the help of a tactile interpreter. At the time, I thought to myself that could be me someday, and I have never forgotten about him. So I decided to try out MSSD and am very glad that I did for many reasons. The daily experience of the deaf culture bridged that gap in my life. At MSSD, I met my best friend on the first day, and we have shared a special bond ever since. And through him, my deaf community of friends grew significantly throughout the years. However, I returned home for my high school senior year because at that time in my life, I felt like I belonged in the hearing world more than the deaf world. Learning and understanding sign language is very difficult when you can’t see the signs and facial expressions at the same time, rapid-fire finger spelling, and when they don’t use their voice or lip movement. Tactile sign language is even more difficult to master. I was under a lot of pressure, and anxiety, to learn sign language within a short period of time while at MSSD in order to function better and feel a sense of belonging. In fact, I had to fingerspell my answers in classroom discussions because I knew very little word signs. In one class, each individual drew a name of a Christmas song out of a hat being required to sign it at our Christmas program later on. And of course, I drew the song called “The 12 Days of Christmas” with only about a month to prepare. After graduating from high school, I attended St. Cloud State University in Minnesota since they had staffed resources for the hearing-impaired. I figured college was my chance to start with a clean slate in being honest about my Usher Syndrome. Well, I was honest with my new circle of friends of whom all are still very much in my life today. However, I wasn’t always honest with my professors and even when dating. In Astronomy class, the professor would turn off the lights and we would all lean back in our chairs and look up at the ceiling. He would talk about the “billions and billions of ball bearings” (stars) as we studied the constellations. For my eyes, “billions” seemed a bit exaggerated as I could only see a few of them. I “got by” until the day of the final exam. As I sat down in my chair, I was mortified to find out that the exam would be on the ceiling, and not on paper. After class, I had no choice but to explain to the professor that I couldn’t see in the dark and requested a paper exam of which I was granted one. That was an extremely embarrassing situation to be in. When I was dating in college, I was open about my hearing loss because after all, I wasn’t hiding my hearing aids with longer hair like I did in my younger years. But at that age, I sometimes felt it would be too much of a burden if I honestly disclosed my vision impairment in addition to my hearing impairment. I “got by”, until one night after dropping off my date at her home after dark, I ended up driving into the ditch on the opposite side of the road in the middle of nowhere. Stuck, all alone in sheer darkness. There was only ONE light that I could see across the road up a ways, which was from a light pole of a farmhouse. I was terrified walking through chest-high weeds towards that light at midnight wondering what might be lurking in the weeds and what kind of a greeting I would get from the farmer. Thankfully, I got a ride home. In early January 1996, I had just sold my car to give up driving at the young age of 28. That was my Christmas present to myself as well as to the world around me. I had driven for 11 years, but shouldn’t have been driving for even half that long. Did I mention that on the first day behind the wheel in drivers training, I struck a dog? The dog survived. How about the time I drove through a railroad crossing when the gate was down on a perfectly clear day? As I pulled over in shock and got out of my car with shattered glass all over me, the train was right there slowed to almost a halt with the conductor leaning out the window asking if I was okay. What about the time I was stuck in the middle of rush hour on a Minneapolis freeway after a job interview gone long as darkness fell, thus embedding me in a sea of blinding vehicle lights? Somehow I managed to get off the freeway to a gas station phone booth to call for a ride. Because I was having an uptick in vision issues at the time, my parents took me to a local RP Specialist in St. Paul, Minnesota. The RP Specialist told me some news that rocked my world even more – that I would nearly go blind in 2 years. Now this was his diagnosis with inadequate equipment. No driving. No independence. Hearing impairment. Blindness. All by the age of 30. Not the kind of life I had in mind, especially at that age. Exactly 2 years later, I did go blind, but in a different context. I went on a blind date that a friend set me up with. My blind date turned out to be my wonderful wife, Sharon, of 18 years. In hindsight, I firmly believe that through the RP Specialist’s diagnosis, it was a message from God assuring me that He is taking care of me even though my world seemed to be crashing down. My journey with Sharon has led me (us) closer to God through a stronger relationship with Christ. Sharon has been an incredible impact on my life ever since. She helped continue the care my parents, sister, and friends had provided me for so long. In 2003, from the encouragement of Sharon and others, I reluctantly agreed to take mobility training for using a white cane. It was a slow process to accept this new kind of personal identity, but there was an increase in unpleasant public incidents where if I were using a white cane, it would have done the talking for me. I was also having more difficulties navigating my way around as my field of vision continued to shrink. I struck up a bond with my mobility trainer, and he gave me a whole new perspective. My training was mostly after dark in various strategic places. It even included a trip to the Mall of America right here in Minnesota which is one of the largest malls in the world. My assignment was to meet my trainer at a specific place at the other end of the mall by using my white cane to navigate. That was way out of my comfort zone, but I was surprised how much easier it actually was. I was then eager to try it out at the Minnesota State Fair which always draws a huge crowd. As I walked down the street at the fair with Sharon to my left and my right hand using the white cane, the visual was like the parting of the Red Sea as the crowd spread to both sides getting out of our way. I felt like Moses in that instance! Despite my new perspective, I was selective for a while as to where I would use the white cane. I much preferred to use it in places where nobody knew me as opposed to my normal stomping grounds. The reason was that I felt it would be questionable because I’ve been getting around in those places for so long without the white cane. Boy, was I wrong. That experience had a very profound and powerful impact on my life. I was able to find lasting peace with my Usher Syndrome because of my closer relationship with God through Christ. It is important to understand that God doesn’t cause these things to happen, but He allows it for good reason. Now what possible good could come from Usher Syndrome, right? Instead of asking God “why me?”, I pray to God to “use me” (and my Usher Syndrome) for the good of others. After church service that weekend, people that I had never met before were telling me how my story had helped them in dealing with their own sufferings and pains. God’s glory shines brightly when we come together and help one another. It makes us stronger, and it transforms us to be more like Jesus. Don’t get me wrong, I really want a cure in my lifetime, and I still get frustrated being accident-prone. But if there isn’t a cure, I am comforted knowing that God will provide me with what I need, and He always has. Back in 2006, Sharon was told by doctors that she would not be able to bear children of our own. However, in 2010 Sharon gave birth to our daughter, Sadie. Later that year, Sharon and I were coming out of a restaurant on our 10 year wedding anniversary, and I happened to look up in the sky. I saw one bright shiny star. Remember Astronomy class? It was truly remarkable that I could actually see the star, but what did it mean? Well, we soon found out that Sharon was pregnant with our second child. So in 2011, Siena was born. What blessings! Before we even decided whether or not we wanted to have children, I was hesitant because I was already a handful with Usher Syndrome. And so again, I firmly believe that God wanted to prepare us by strengthening our relationship with Him first. He knew, just like I suspected, that being a father with Usher Syndrome would be a difficult undertaking and would require a lot of patience. But as long as God is the foundation of our home and the captain of our ship, we will get through it all. At Christmas service in 2013, the human nature in me was feeling so overwhelmed with frustration and anxiety of my worsening Usher Syndrome, raising children, and the ever-changing environment within my workplace. But during the sermon, the pastor said, “You may feel that God is far away in your struggles, but He is a lot closer to you than you realize”. I was overcome by emotions, and I broke down crying. But that was happy tears because it was another reminder to me that I am not going through this alone. That was such a comforting feeling at the right time. I have been blessed with a job that I can do despite Usher Syndrome. I am a computer programmer and have worked at Travelers (aka St. Paul Companies) in St. Paul for over 25 years. Back in 1992, my counselor from the State Services for the Blind (SSB) encouraged me to attend the Multi Resource Center (MRC) in Minneapolis for a 9-month class in computer programming. MRC is a school for those with any kind of disability, and they have a working relationship with companies around the Twin Cities area to help employ MRC students. Sure enough, MRC set up an interview for me with then-St. Paul Companies and I was hired. The company has been very proactive in helping me with the things I need in order to do my job. I have always had very supportive managers, Human Resources, and colleagues over the years. In 2010, Travelers adopted a pilot program called eWork. This program allows selected employees to work from home a number of days per week, which was something I had long been waiting for. Turns out that I was one of the employees selected! Each week I work 4 days at home and 1 day in St. Paul. This was a God-send at the perfect time because it minimized the hectic commute with our newborn child to get me to work and home. After 8 years, I have proven that I can successfully and productively do my job from home. Sharon became a stay-at-home mom and this setup was very much needed. Now that our two daughters are growing up and in school, Sharon has gone back to work part time. Raising children is certainly not easy and you can never fully train for it. Most of my fears of what I envisioned I would struggle with being a father with Usher Syndrome have come true. Everything is so much harder for us to do than it would be for a typical family. One of the hardest things (of many) for me as a father, is arbitrating disputes between our children. The reason is because if I don’t clearly see and hear the crime (even as the scene unfolds right in front of me), how do I fairly and effectively handle the situation? And in the heat of the battle, you can’t just push the pause-button to get me up to speed on what is going on. I am often in a state of confusion in those situations. It took a long time for my two daughters to understand that daddy doesn’t see or hear them well. By the time they were each 3 years old and walking/running around, many accidents had occurred where I would knee them in the head in my path around the house. I am 6’3” tall and my daughters are a long ways down there, way outside of my peripheral vision. They thought I was being mean to them on purpose, only because they didn't understand. I spent so much time trying to persuade them that “Daddy didn’t see them." Nowadays, they know to put their hands out in front of them if they see me coming and I am not looking down at them, especially on the stairwells. That technique has prevented many more accidents even though it causes me some pains in my midsection areas. But I’m more than happy to take the hit instead of them. In public places today, my two daughters would help me by holding my hand, taking my hand and placing it on the handrail, or even come back to get me if I fall behind. They also like to help by grabbing my white cane and guiding it, of which in this case, it’s the thought that counts for me. My daughters have also learned how to use various options to communicate with me other than voice whenever needed. That includes sign language and gestures, writing it down on paper, or just bring me to the subject matter (and vice versa). That all took time, and a lot of frustration along the way, but there is always a solution if you work at it. One night around Christmas 2014, I was tucking Siena in bed and turned off the lights in her room. She got out of bed, turned the lights back on, showed me “I love you” in sign language, and then turned the lights back off. I was on the verge of tears. This was my defining moment as a father, where my 3 year old daughter, who understood that I cannot see at all in the dark, wanted to make sure I could see how she felt about me. Again, God was telling me to hang in there, and He’s got my back. Today, I am 50 years of age. My field of vision for each eye is roughly 15 degrees, 20/100 central vision (uncorrectable), night blindness, some color blindness, and high sensitivity to bright lights. As things continue to become more difficult in all aspects of my life, my priorities change and I need to adapt along the way. As a result, my family life has become more functional, I am much more engaged at my workplace, and I have a strong desire to be even more involved in the blind and Usher Syndrome communities to help and participate in any way I can. Since 1997, I have been visiting great doctors at MEEI in Boston every few years so that they can follow my progression which helps with their research and findings. For the past 12 years, I have participated in VisionWalk (Twin Cities) which is an annual event around the United States in many cities to raise awareness and funds for research/trials in an effort to cure blindness. I have also shared my story in multiple local avenues, but I feel God nudging me to reach out further in the world. In January 2017, I had Cochlear Implant (CI) surgery for my left ear due to declining sound clarity in my overall hearing. With my hearing aids in recent years, people were starting to sound more like the adult’s mumble jumble in a Charlie Brown cartoon episode. It is a long process to reap the benefits of the incredible CI technology, but at least I will always have hearing. Someday, if I feel the time is right, I may have CI surgery for my right ear. Currently, I am exploring the possibility of a guide dog because I feel I have arrived to this point in my progression. I have absolutely no doubt that a guide dog would enhance my quality of life in so many ways. But at the same time, I am very excited in the latest advancements in the research and trials for a cure. Growing up, the 6 Million Dollar Man (bionic eye) and The Bionic Woman (bionic ear) were among my favorite TV shows. Back in the 1970’s, that was more of a fantasy. But today, it is a reality. If you are to persevere in your struggles and overcome obstacles, it is essential to step out of your comfort zone. This allows you to grow in strength, confidence, and courage over time. Be honest with who you are and what you need, because at some point in time, “getting by” isn’t good enough anymore. If you would like to reach out to Shawn, you may do so at shawnhewson@gmail.com.